Every day I spend at Dacres Wood I learn something new. 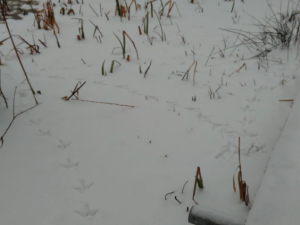 Last week it was how to identify animal tracks left in the snow and what moorhens like to eat. The week before that it was wood carving and bricklaying. The past week or so however, for me, has been a lesson in how to hold different kinds of spaces at Dacres Wood. Spaces for quietly concentrating, dreaming and making; as well as spaces for group play, discussion and laughter. From the outside looking in, one might assume that the only kinds of activity that exist involve running, shouting, banging and crashing! Certainly our neighbours feel this way some of the time, and often when I speak to people about Democratic Education some assume that the children are ‘just messing about’. We have always asserted that any kind of activity including ‘messing about’ is possible at Dacres Wood as long as it does not harm or negatively affect others. So any rambunctious activities should be just as possible as sitting and reading a book, researching, studying and playing with numbers. But just because these things are possible doesn’t mean that the environment is necessarily set up to facilitate them. So the past few weeks have been a time for Rowan and I to reflect on how to set up different kinds of spaces for different kinds of pursuits. Setting up a quiet space was not high up on our priority list when we first opened Free We Grow last year. For the first few months, the children were less interested in activities and projects and more concerned with just getting to know one another. As time went on however, it became clear that some children were beginning to need a space for quiet and focus. New children joining the group were in need of somewhere to be calm, some found the charging around too tiring, and children were generally expressing more interest in projects. 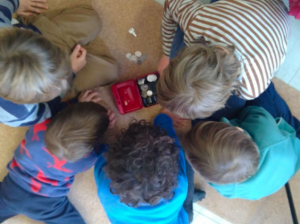 We realised that although it was possible in theory for children to sit down at the table and draw, when the children arrived in the morning and turned the whole building upside-down, built dens and got ALL the games out, there was no space for quiet and focus. In reality, unless the children found a tranquil corner in the forest, there weren’t any peaceful places for focused activity. When Rowan and I were lucky enough to visit Summerhill School a few weeks ago, we saw the classrooms curated and managed by the teachers alongside spaces outdoors and indoors for free play. We decided to discuss this with the group and to suggest creating an indoors space dedicated to calm activity. First, the group agreed to transform the entire building into a quiet space. However, when we tried this, it just so happened to be the coldest and snowiest day of the year and it was very difficult to keep everyone quiet indoors. The new rule lasted for the best part of 10 minutes. The next week, it was decided that one room would be called the ‘Sitting Down Room’ and the other room leading onto the kitchen would be called the ‘Upside Down Jungle’ – no more explanation needed. The idea was not to place a higher value on calm activity over playing with friends, group projects and generally charging around the forest, but rather to make both options possible. There was lively debate from the community and parents. Some wondered whether the term ‘Upside Down Jungle’ might encourage jungle behaviour, and others wondered whether the group should reserve the right to use the space however they saw fit and not place limits on this. We agreed to try it out and see. The shift in the environment that we’ve seen since establishing the two rooms has been quite dramatic. The Sitting Down Room which used to be filled with mess and hustle and bustle was quickly replaced with whispers, books, pencils, glue and board games. Last week I was doing some woodwork outdoors and walked in to get the tool kit. My jaw fell to the floor as I entered to see two children sitting quietly leafing through books and two children sitting with Rowan at the table writing a story. We had seen lots of pockets of this kind of activity before but not so much in one go. The next day, I spent the morning making masks in the Sitting Down Room with one child who is usually to be found running around the forest. Children came to ask him to play with them, but calmly he insisted that he wanted to finish his mask first. Rowan and I exchanged a look of astonishment when she returned an hour later to see that he was still there working on his creation. Finally, Rowan and I have also been able to enjoy more periods of focus. We usually flit between indoors and outdoors regularly throughout the day, swapping places in order to allow each other time outdoors and indoors. By defining the spaces more, it so happens that we are spending most of our day in one place, delving more into projects: personal and shared. This has involved focusing our attention on curating the Sitting Down Room, setting the craft table with materials and generally keeping ourselves available if a child needs support, or staying in one place so that the children know where to find us if they need us – and equally so that they know where to go if they want to avoid us and have some privacy. 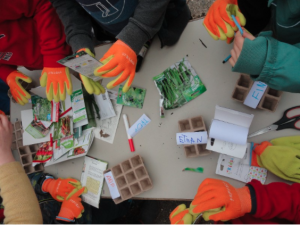 Overall, it is amazing to consider how much Free We Grow has evolved in the few months since we opened our doors; as we get to know one another’s personalities and intricacies, as we develop rhythms and routines, and as we allocate uses to different spaces. As we approach the end of this term, with the initial excitement of the new project and the ‘Deer Herd’ phase behind us, we are entering a shift where the space offers more opportunity for absorbed activity and ‘flow’. And the possibilities are endless. As opposed to traditional school where quiet and concentration are enforced, with playtime offered as the reward for hard work (and this privilege is taken away when the children don’t comply), the children at FWG spend their time running, jumping, climbing and playing together until waves of inspiration draw them to build, create, measure, study and experiment – the yin and yang of life, calm and chaos, Sitting Down and Jungle, as they are supposed to be experienced: freely and authentically.